As a child, I read a lot. As a teen, I read even more. Now, as an adult, I realize how much all of that reading shaped me as a writer. I would spring out of bed like it was Christmas on RIF (reading is fundamental) day and come home with a beautiful, crisp new book. The funny thing was, it was always the same book I brought home. My other copies of it became worn, and the covers tattered between my sticky, little fingers. I always seemed to need a new copy. I'd stash the old ones on my bookshelf and put the new one on my desk so I could enjoy the shininess of its cover. That book was Where the Red Fern Grows, by Wilson Rawls. The story of a boy and his beloved hunting dogs, living with his family in the heart of the Ozark mountains. It captured not only my attention, but my heart and I read it over and over again. If you look this book up, you'll find it's categorized as a children's novel as the main character is ten, but by many standards it's best read by fourth grade and up due to some salty language. There's also some significant violence, but absolutely none that I would consider gratuitous or irrelevant to the storyline. Whether or not I knew it at the time, this book influenced me. It made me feel everything right along with the main character, Billy. It made me want hunting dogs even though I had no idea what on earth I'd do with them. I was completely sucked into the story and no matter how many times I read it, I was always in tears by the ending. There are several books I could cite as being influential, but Where the Red Fern Grows definitely takes the prize for the strongest. Wilson Rawls taught me how vivid language and a beautiful imagination can weave magic. Reading that book encouraged me to write. The ability to move people with words like he could became far more alluring in my fourth-grade mind than any super power out there. Recently, I read this book again with my son. I can't begin to tell you how powerful it was to see how it effected him, how excited he was for our reading time and how touched he was at the end of the book. Have there been other books that touched him? Of course. But not many that left a mark on the heart like this one. As an adult reading the book again, I'm in awe of this author's ability to juxtapose the bleakness of Billy's poverty with the perfection of the pristine land his family hunts. Rawls was unafraid to capture the moments of darkness in childhood, and the heartache of learning some of the harsher lessons in life. At the same time, he managed to grow that thing we all thrive on - as children, teenagers, adults. HOPE. That four lettered word that keeps us reading. . . keeps us wishing on stars and blowing eyelashes off of our fingers. 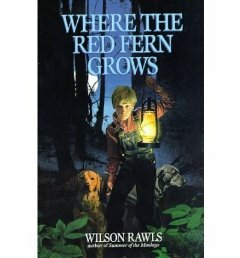 So, Where the Red Fern Grows -- my favorite childhood book and one that has stood the test of time for me. I can truly say although it might be a different appreciation, I love it just as much today as I did when I was ten. or follow her on twitter at https://twitter.com/lindsayncurrie.